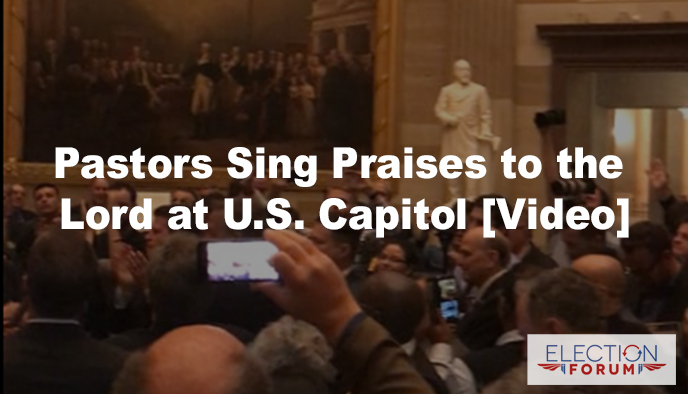 Finally, watch, enjoy, sing and worship with these pastors and my wife who recently gathered in the U.S. Capitol Rotunda. Here’s a video of them singing the Doxology in high spirits. Imagine if our congressmen sang praises to the Lord and bent a knee daily in seeking His guidance, just as our Founding Fathers did. Oh, how blessed we would be as a nation! Truly beautiful and Into the glory of the Lord. And what way is better to evidence we truly love the Lord, than to follow up praise and worship with engaging in the ‘works’ required to represent Christ in government and society. Representation to the displacement of God offending societal and governmental pathologies testing the justice-side of the very God who makes and breaks nations. This, because “faith without works is dead,” and because Christ expects us to ensure our children and grandchildren inherit usable God given inalienable rights. This, instead of the tyranny our children and grandchildren will inherit if Christians do not return to lawfully representing Christ in society and government, as was done by enough Christians in pre-1900s America to cast out British tyrants and end slavery. Absolutely fantastic. Got me teary-eyed! The 3-second echo was something else. Wouldn’t it be something if ALL OF THEM spread out from this room, preaching the Gospel to EVERYBODY THEY ENCOUNTERED??!! Just think of it. It would spread like WILDFIRE. Washington, DC wouldn’t be able to contain it. Thank You Lord!! that was an incredible event, the echo of praises for our Lord in the chamber was magnificent. •To unashamedly acknowledge, our Heavenly Father, His blessed Son and the ever-present Holy Ghost…who has richly blessed our country, FAR beyond our understanding! Praise be, to His powerful & matchless Name…AMEN.